The M35X brings music alive by capturing every nuance of a recording from deep drop bass to exceptionally clear mid and high frequencies. Designed specifically for use with House/Techno mixing environments, the cartridge's low record wear helps DJs preserve hard-to-replace vinyl, while its high skip resistance serves as a safeguard against the hazards of back-cueing. The M35X combines high sonic accuracy and incredible skip resistance, all while keeping record wear to a minimum. 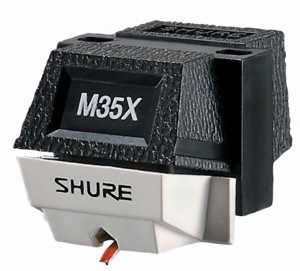 The M35X's versatile Shure Type I medium-diameter cantilever can stand up to continuous, demanding use, yet it is sensitive enough to trace signal modulations as small as a millionth of an inch. With a tracking force range of 1.5 to 3 grams, the M35X provides excellent skip resistance.